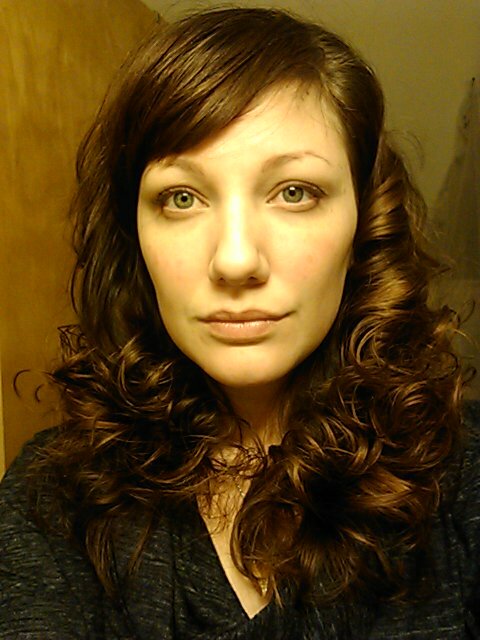 Today I'm going to talk about how I "do" my hair. I wash with either a regular sulfate shampoo (Suave Rosemary Mint right now), or the Shea Moisture Coconut and Hibiscus Curl and Shine Shampoo, OR the Shea Moisture Raw Shea Butter Moisture Retention Shampoo. I only really scrub at my scalp, and just rinse the soap through the length. Then I apply a handful of VO5 conditioner to the length. I use the pomegranate one, because the Moisture Milk versions have too much protein in them for my hair type, and the other one available at Wal-Mart is the green daily clarifying one. I loop my hair up into a clip while I continue my shower, periodically taking it down, applying more conditioner, and putting it back up. I repeat this until my hair isn't absorbing any more of the conditioner (usually 3 times). Then rinse. It is VERY important, on hair-washing-night, to make sure you really scrub your scalp clean. You won't be washing it again for at least two days, so this is your chance to get it really clean! After my shower, I let it air-dry for as long as possible. Then I apply a dollop of Shea Moisture Coconut and Hibiscus Curl and Style Milk to the ends, going about halfway up the length. Then I blow-dry on low (not cool) heat until it is almost completely dry. I apply another dollop of the Style Milk, and keep distributing it so it's not concentrated in any one area. Then I brush it all out, with my head flipped over (I do almost all the drying with my head flipped over, because it's easier to reach my ends that way). I separate my hair into two sections; the hair from the top of my ears and forward, and the hair from the top of my ears and back. I create two ponytails, right on the top of my head, or as close as I can get it. I secure them with scrunchies. You can use hair ties, but I find that scrunchies work the best and don't leave dents in my hair. 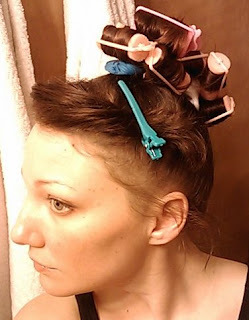 Now, using big, pink foam rollers, I roll up small sections of the ponytails. 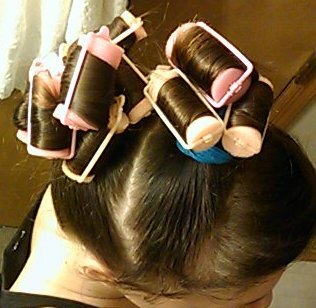 I use 3-5 rollers for the front, and 5-8 rollers for the back. 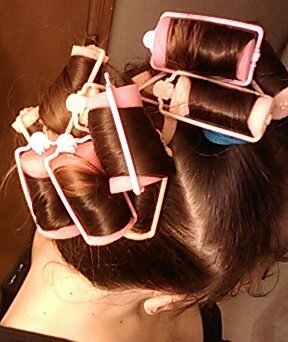 I try to roll them up so that the rollers in the front of each ponytail roll towards my forehead, the rollers on the side roll towards my ears, and the rollers in the back of the ponytails roll towards my neck. After trying several different placement directions, I feel this one gives the best variety in curl pattern, while still maintaining a "put together" hairstyle. Don't worry about frizzies or little baby hairs that don't make it into the curlers. 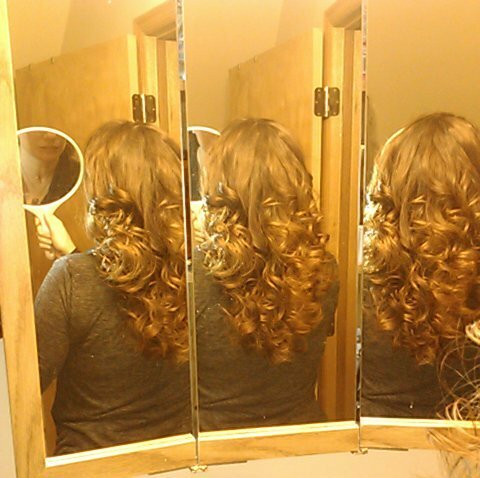 They'll get lost in the curls when you take your hair down. DO worry about combing each section before rolling it, to make sure you will get a smooth curl. 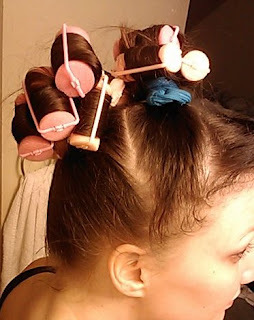 Making sure the ends of each section are rolled around the curlers properly will avoid kinks in the ends of your hair. Avoiding kinks in the ends of your hair means you don't have to wash it again the next night in order to remove those kinks. 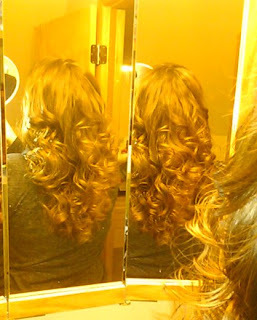 From the start of blow-drying to being done with the curlers is about 25 minutes. You'll notice that I just clipped my bangs (fringe) to the side. 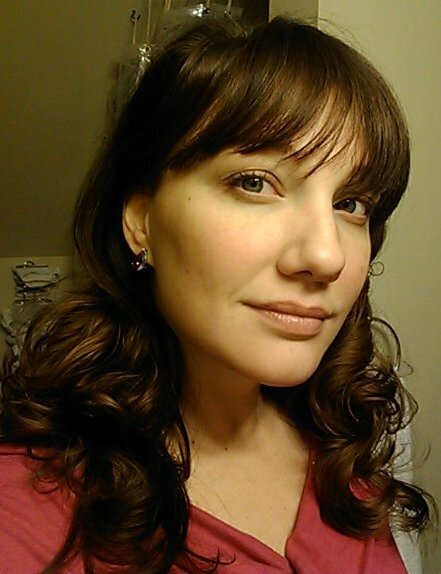 To make my hairstyles last multiple days, I have to wash my bangs each morning, and then blowdry them. 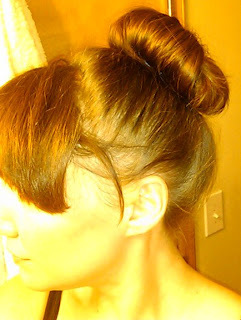 It only takes a few minutes to do that, and it gets any oils and makeup out of my bangs. Therefore, when my bangs are long, I just clip them out of the way and don't worry about them until morning. Now, I'm washed, dried, moisturized, and curled. Time for bed! Now, after the new day has turned into night, it's time to put the hair back up. 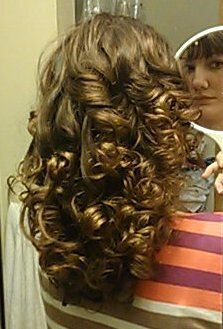 I apply more Curl and Style Milk to the ends; about a quarter-sized dollop. It will take a few times to figure out how much you need. It does take a little more than you think it will, because all of these curlers are soaking up some of the product. 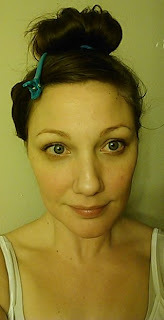 After applying that, I brush my hair out, and put it into a single pony tail on top of my head, secured with a scrunchie. Some times are more successful than others at getting it on top, but as long as it is near the top, you should be fine. 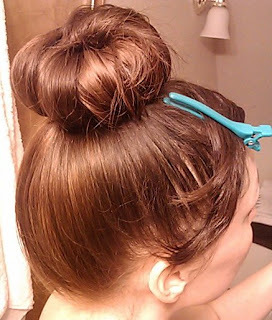 Now it's time to do a fully-rolled sock bun. Here is a quick tutorial. Because the hair was curled last night, it is going to be really easy to curl it around the sock. 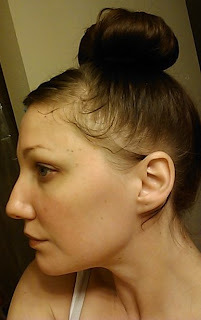 I put the sock at the end of the ponytail, divide the pony tail in two, wrap one section towards the front, and one section towards the back (so that you are dispersing the hair more evenly around the sock doughnut), and then roll the sock bun doughnut towards my head. HaHa, that front one is a goofy face! You'll notice the lovely blue clip again! You'll also notice that this isn't perfect. It will take some practice until you figure out how messy you can be and still end up with pretty hair the next morning. This is as messy as I'll allow it to get before I start over. The good part is that once you figure out how to roll your hair into the sock bun, it only take a few moments. How do we fare the next morning? Dun-Duh-Duh-Duuuuunnnn!!! Viola! 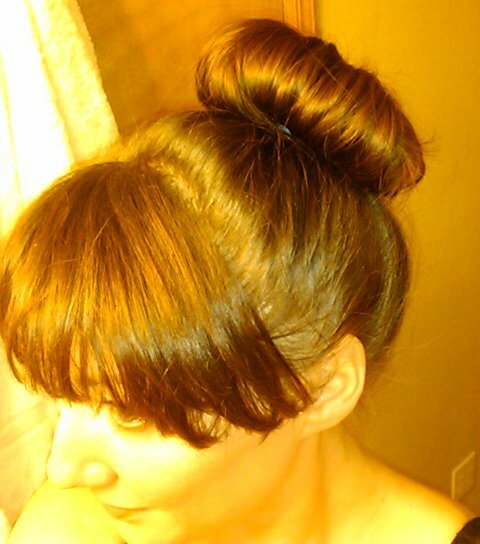 All I did was unroll the bun, remove the scrunchie, shake my head and run my fingers through it a bit, and wash my bangs. It took 3 minutes. I timed it. How about a third day? Well, that is pushing it for me, but it can be done. Do the fully rolled sock bun on night number 3. You might want to wash your bangs tonight too, if you didn't do that this morning. I washed mine that morning, but I washed them again here, too. They touch my face, and I wear makeup and I use oil to cleanse my face, so I like to keep that hair really clean. 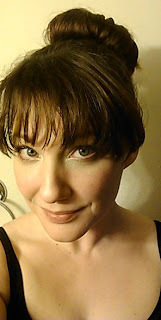 I'd call that good, aside from the lop-sided bangs! Those can be clipped back, braided, or re-washed. 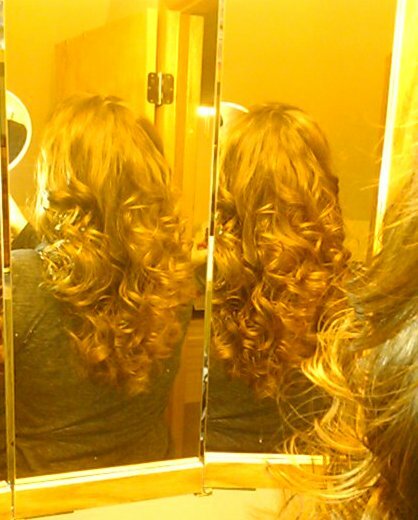 So there you have it, how to get two to three days out of one hair washing! What do you think? And hey, if you try it, I'd love to know how it works for you!